We continue the story about Dealjoy – a platform that makes shopping much more enjoyable, because they will make a profit! Today’s part of the review, we begin by pointing out to the reader what outstanding partners have already been connected to the program. Usually, we do not dwell on this, but this time, it’s simply impossible to ignore the fact that the leaders of each of the spheres will cooperate with Dealjoy. And besides, we will start from this further. Non-remunerative remunerationIn the first part of the review, we have already talked about how the cashback reward is formed: it would seem that everything is transparent and the profits of the sites are easy to explain. But, the problem is that the remuneration services themselves often want to get a little more and, besides receiving incentives from companies for new customers, also sell a little information. Remember, most cashmere tools are offered to us by banks. Having registered a card, you can simply pay it and get a reward for it. But this is only the tip of the iceberg. The main profit the bank receives by collecting information about you, which after can be used and not in your favor. After analyzing what purchases and with what frequency you make, and also, by locating terminals, finding out where approximately you spend the most time, you can get a volume of information that can be used for any purpose. Of course, as a rule, banks are not the most malicious organizations and sell your data only to large companies that, based on the provided data, create products in which the population needs the most. But the nature of the information is such that, having received it, you can sell further, as many times as you will come to mind. As a result, somewhere on the bottom step of selling information, it can be in the hands of an attacker. Therefore, to your information you need to be careful, in what you can help the service Dealjoy. All the purchases you make and the cashback that you receive are anonymous, which means you do not have to trade. 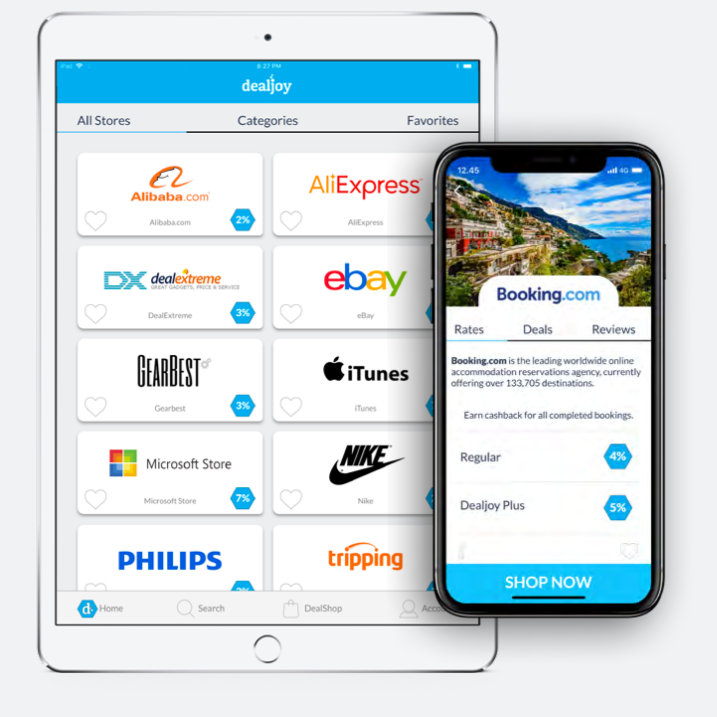 Dealjoy is not interested in collecting information about you for sale – for this purpose there is a better destination, when you work with such well-known partners. Intellectual shopAnd the truth is, why sell data when, with a skilful approach, they can be skillfully used by oneself and profit from it. This is how they thought in the Dealjoy team and launched their own store on the platform. But this is not just a playground, where you can choose what you like. After analyzing the structure of your behavior and defining customer accentuations, Dealjoy will be able to determine which products will be more interesting to you than others. For example, by determining your gender and age, he will be able to offer you those clothes, services, food, cars that will be of interest to you. Agree, no matter what flipping the whole page of dresses, when you are a sixty-year-old man . However, these data only characterize your personality, while the platform itself does not require you to identify any identifiers other than those specially designed for use by the platform. As a result, you will know that although the information about you is collected, it will be used only to make the stay in the store even more comfortable. By the way, although all the services of Dealjoy are conditionally free (in the process of using the platform gets its from sellers), there is also a paid function that you can get. The platform provides for the creation of an account that has certain privileges, such as increased percentages of cashback and others. However, even for this you do not have to pay in the literal sense of the word. As always, block-platforms demonstrate their loyalty to the user: in order to get Dealjoy Plus you will only need to deposit a certain amount of the deposit. In case you no longer want to use the advanced features, this deposit will return to you in the wallet. 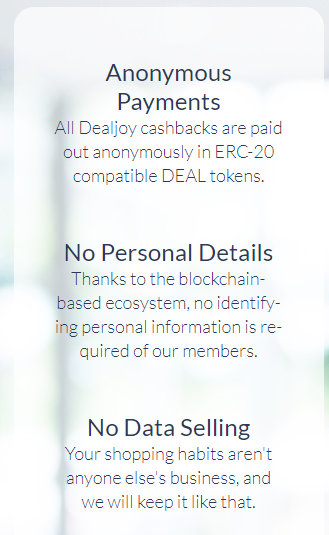 This concludes the review of the Dealjoy platform. We hope that, having secured such a strong support, the project is obliged to live and very soon will give us the opportunity of purchases that bring profit. In addition, it makes it comfortable and safe. After all, it is reward and convenience that makes a person devoted to certain brands and companies.